May 2, 2007 0 comments on "How to Grow Plums"
Plums are an easy to grow fruit that is delicious and healthful. 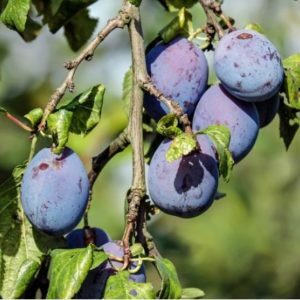 Here are some tips on how to grow plums. Plum trees will grow almost anywhere in the United States. Research the type of tree being planted before purchasing. Some varieties require another tree for pollination while some are self-fertile. Pollination only occurs during a ten day period. Plum trees should be planted about 20 feet apart. Plums prefer fertile and well drained soil. Plum trees should be planted in late fall or early spring. Do not add any fertilizer at planting time. Once established an early spring application of a 10-10-10 fertilizer can be applied. Use eight ounces of fertilizer for each year of the age of the tree. Or a fall application of bone meal can be applied instead. In the early spring apply a layer of compost around the tree to the drip line. But do not allow the compost to touch the trunk of the tree. Also apply a mulch of straw or wood chips around the tree. This will help retain moisture and prevent weeds from growing. In areas where spring frosts occur the plum trees must be protected if they are in bloom when the frost occurs. In June, prune the tree in order to prevent breakage of branches later in the summer. Open wounds are an invitation for a fungal infection called silver leaf disease. Thinning the growing fruits will also help to prevent the branches from becoming too heavy. When fruit starts forming, cover the tree with bird netting to protect the fruit from birds. Harvest the fruit when the plums just starting to soften. A refrigerator is the best place to store the harvested fruit. It will remain fresh for 2 to 4 weeks. While plum trees are susceptible to mites and other fungal diseases plum curculio is the most common. Marilyn Pokorney is a freelance writer of science, nature, animals and the environment. She also loves crafts, gardening, and reading. Like this article? Check out my recipe for canning plum jelly.